When my parents got married in 1941 they received this unassuming but beautiful vase as a wedding present. It's a great example of the American Arts and Crafts movement that applied fine design to simple household objects. A whole bunch of pottery companies flourished in southern Ohio around the turn of the century (that is, 19th turning to 20th), including Roseville, the maker of my vase. A while ago I decided to look online to learn more about my particular vase. Since Roseville produced dozens and dozens of different patterns, and dozens of different variations on each one, I despaired of ever locating the one I wanted. Fortunately I recognized the flower as a columbine, and sure enough, there was a pattern called "columbine." It was made in three different colors, blue, pink and brown, and several different shapes and sizes. After I'd spent some time clicking around on the website I realized that my vase was also identified by a number -- 17-7 -- and sure enough, that was one of the models listed under the columbine pattern. It was dated as "circa 1941," which would be exactly right. Apparently the vase is worth slightly over $100, but I know I would never sell it. Nor do I use it for flowers, not that I'm hesitant to use family heirlooms but because I own plenty of vases in the same general size and this one sits so happily on a shelf in my office. Some years ago I got to spend a couple of long afternoons at the Zanesville Museum of Art and was impressed by its large collection of art pottery, both vintage and contemporary, Zanesville, which sometimes calls itself the Pottery Capital of the World, is obviously proud of its industrial/artistic heritage, which was made possible by lots of good quality clay. Here's a slew of Roseville from the museum. Makes me kind of wish my vase had been pink instead of brown! Last week the great artist Magdalena Abakanowicz died. 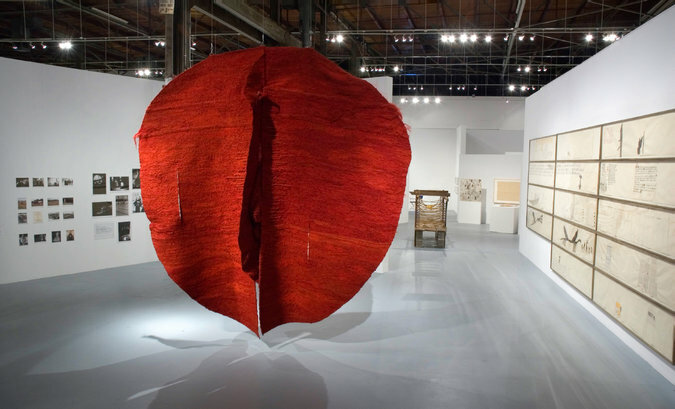 Had she done so decades earlier, she probably would have been described as a fiber artist, because that's where she started off, making flat works out of burlap, bedsheets and clotheslines and weaving monumental pieces that were exhibited in Tapestry Biennials. But, as the New York Times obituary put it, "Chafing at the limits of fabric art, she began to conceive of her work in sculptural terms," going 3-D with fiber and then with wood and metal. Probably her most familiar works are the long series of huge forms she called "Abakans," a shortening of her own name. Which, by the way, reflects her ancestry: she's a direct descendent of Genghis Khan, through his great-grandson Abaqa Khan (get it?). 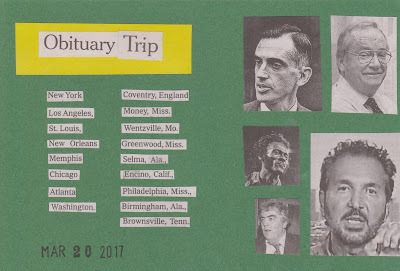 I realized from the obit that all these years I have been mispronouncing her name; it's supposed to have the accent on the NO, not on the KAN.
Abakanowicz frequently made forms that closely or not-so-closely depicted people, and arrayed them in big crowds. Looking at these works last week made me think hard about my own recent foray into making crowds of people from fabric. I realized that Abakanowicz's people took strength and meaning from their crude forms and construction. I had already been wrestling all along with not wanting my own people to become cute, not wanting them to become exercises in doll-clothes-making. Now with Abakanowicz in mind, I made some new people that were deliberately more abstracted and more rough-edged. I omitted the arms and kept the frayed edges prominent instead of turning them to the inside. I replaced my usual cord wrappings with self-wrapping from torn strips. I like the effect and will probably stick with it for a while. My homage to a great artist. Yesterday I showed you some of my earliest forays into printing on fabric with my printer's type. Some years later I got into a new phase of printing on fabric, using the letters as abstract designs rather than to spell out words. Here's an example: I prepared the background by stitching the large letters into tight bundles and applying fabric paint with a brush; the paint wicked out just enough to make a fat initial. Then I printed the smaller letters on top. 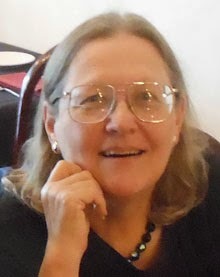 I worked for 20 years at a company that was the world's largest employer of actuaries, and much of my work involved translating complicated actuarial concepts into terms understandable by our non-actuary clients. So I spent many hours hanging out with actuaries, and my son also trained to become an actuary. I was envious of their ability to think in numbers, and imagined that when they lay down to sleep, they might see numbers floating about. I made a quilt covered with numbers and called it "The Actuary's Dream." It wasn't in the roll that I unpacked last week and I don't have a good photo, but the next time I come across it I will take a picture and show you. Subsequently I made a half dozen or more "actuary quilts" -- here are four of them. As in the alphabet quilt above, I bound or sewed the fabric into bundles, then applied fabric paint to make the underlying patterns, before printing on top. Here I clamped the fabric and dunked it into bleach. The discharged patterns looked to me like maps. I moved on from this style of quiltmaking a long time ago, but these looked fresh, original and exciting when I look at them today. Maybe it's time to go back to printing on fabric! Last week my art book club (the one where we never read books) had the theme of printmaking. I was busy and instead of embarking on a new printmaking endeavor, I found the roll of quilts that included several that I had printed many years ago. That seemed good enough for government work, so I took them for show and tell. I was surprised to find one quilt that I had absolutely no recollection of ever making, and some that I had pretty much forgotten about. But all of them looked fresh and interesting, which made me happy! These quilts were made as long ago as 2000 and as recently as 2009, and most of them followed the same general recipe: make an interesting abstract fabric background, with fabric paint or discharge, then print letters or numbers from my big collection of old wood and metal printer's type. I would do the letters one by one, applying fabric paint with a brush and then printing them onto the fabric like a rubber stamp. Later that same year I made a quilt for a challenge on the Quiltart list. We were to depict a proverb or saying from Ben Franklin. I found one in "Poor Richard's Almanac" and came up with this illustration -- one half of my total lifetime production of representational imagery in quilts. I found a cow on a cheater print fabric and gave her a 3-D ear and tail, but had to come up with Tim on my own. I made my husband pose on a kitchen chair so I could draw a realistic looking guy, and was so proud because it wasn't too cutesy. The saying read: Tim was so learned that he could name a horse in nine languages. So ignorant that be bought a cow to ride on." I'll show you more of my printing on fabric tomorrow. Perhaps it's because I prefer teflon frying pans, but the half-life of much of my cookware seems to be measured in months. I am continually having to buy some new "good" pans, smooth enough for fried eggs or delicate fish, while relegating the "not so good any more" pans to low-end duty, browning sausage and such. Which means it's special that two of my treasured pans are generations old. The one with the long handle came from my mother-in-law; she gave it to Ken before we were married, along with her recipe for chili, which I think he even made once or twice! The big one with the black handles came from my grandmother, and I'm not sure how I got possession, but I've had it for decades. The chili pot hasn't actually been used for chili since I came to direct its use. But it's my go-to pot for mashed potatoes, for frozen vegetables, for green beans, maybe a small batch of soup, and for anything that needs to be steamed if no other cooker is in use to pop the stuff on top of. It's a 4-quart aluminum pan, and still has its original lid, although the original handle on the lid is long gone. Now we use a wine cork, screwing it in through the original screw hole. The cork wobbles a bit, but usually does the job for a couple of years before it needs to be replaced. The pan itself is beat up, with lumps in the bottom; the lid sometimes needs to be rotated a bit before it will slip into place. But I think it's indestructible in all important respects. The big pot, also aluminum, used to be a pressure cooker. When I inherited it, there was a huge lid that locked into place, with a rubber flange to seal it, and a little pressure gauge. I might have tried to cook under pressure once, or maybe not at all, before being scared by the old wives' tales of tomatoes splattered on the ceiling. The pressure gauge was the first part to disappear, followed in a few years by the lid. The rubber flange lurked about in the back of a drawer for decades before I pitched it. So it came down in the world and became just a nice big heavy pot. It's my go-to for big batches of soup, for spaghetti sauce, for applesauce, for mashed potatoes in quantities that my mother-in-law's pot won't handle. Although its own lid went MIA long ago, I have another lid that sort of fits, but it does leak a pale essence of spaghetti sauce onto the stove top when that's the plat du jour. It's permanently stained on the inside, probably from the acid in all those batches of tomato sauce. Interestingly, both the pans were made by companies that used to be big names but are no longer in existence. The pressure cooker was "Ward's Best" -- as in Montgomery Ward, the huge retailer who vied with Sears to put out the best mail order catalog in the world, and this pot no doubt came from the catalog. (And yes, my grandmother's outhouse was supplied with old Ward's catalogs.) The saucepan was Mirro, the big aluminum cookware producer whose factory was in Manitowoc, just up the road from my husband's home in Milwaukee, so this was a local product. No doubt I could go to the store and buy replacement pots that would be prettier, with no bumps, with lids that fit, but where would the fun be? I like the idea that every week I'm using things whose faithful service started before I was even born -- and with any luck may even outlive me, even as they have outlived their manufacturers and their original owners. I wrote yesterday about an exhibit at the Portland Museum in Louisville that features two quilt artists. Jane Lloyd has been in Quilt National several times with her signature spiral technique, as shown in this detail shot. She makes a pieced background, puts a large swatch of fabric over the top and free-motion stitches a spiral through all the layers. Then she takes tiny scissors and painstakingly cuts away a channel of fabric between the stitched lines to leave a skinny spiral (less than 1/4 inch wide), held down with the machine stitching and revealing the pieced background underneath. In this quilt she has also put hand stitching, and some nylon net on top. Jane has made a bazillion quilts like this, and several of them are on display in the Portland Museum exhibit. But she's also tweaking the "recipe" in more recent works. Here's one with the skinny lines making arch shapes instead of spirals. And she has not one but two layers of skinny lines: first the small arches, then a tracery of vertical lines on top that form large arches. 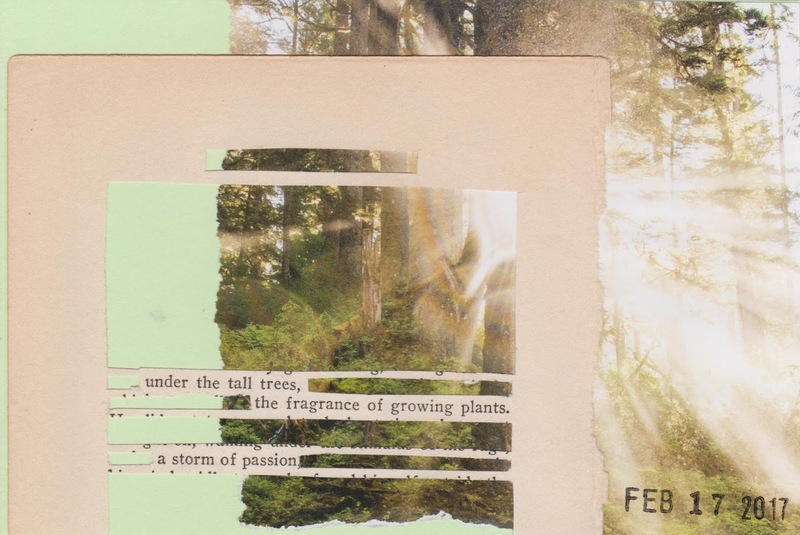 For many years Jane has been doing a daily collage, with cut-up magazines pasted into notebooks. I first learned of her practice when she sat in the back seat of my car heading for Athens OH, cutting and pasting. In fact, her daily collage was an inspiration to me to do the same thing for three years of daily art. Jane has made photocopies of some of her collages and incorporated them as one layer in complex quilts that also include spirals and skinny lines. Although these quilts are very obviously in the same family as her other spirals, the background collages add an air of mystery and additional complication. I particularly liked the very thin, illegible fragment of handwriting that appears in Day Journal. Jane Lloyd, Chin Chin, 22 x 60" (top) and Day Journal, 20 x 74" (bottom) (detail below). When you have known somebody well for many years, and become familiar with their work and their signature modus operandi, it's always nice to see then throw in a new twist. I've always admired Jane's work, and it was great to see so much of it in person. If you're in the Louisville area, check out the show. Art of Color: A New Grasses Exhibit will be on view at the Portland Museum through May 19. I got to see a lovely show last month at the Portland Museum in Louisville KY, featuring two artists from here and two from Ireland. The artistic partnership between the two regions dates back several years; groups from here have traveled to Northern Ireland for a time of collaboration, and vice versa. I was thrilled to have two of my good friends in this show: Denise Furnish, who lives about 500 feet from me as the crow flies, and Jane Lloyd, of County Antrim, Northern Ireland, whom I've gotten to know very well, partly because we've shared two road trips to Quilt National, a total of 20 hours together in the car. Both of them work with quilts, but not exactly your basic quilt-police quilts. If you had to describe her work in one word, you'd probably call Denise a painter, because she starts with old quilts, some of them in advanced stages of decrepitude, and paints on them with opaque or clear acrylics. Often the original geometric pattern shows through, either because she enhances it in her painting, or because you can detect the seams through the paint. After a lot of monochrome pieces in recent years, where the entire quilt ended up the same color, Denise has taken a new direction and painted bold images. I was drawn to her American flag, of course, since that's such a powerful image in my own work. You can see the poor condition of the original quilt in the detail shots. 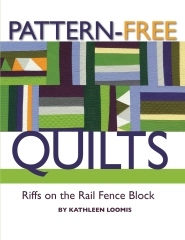 I'll show you Jane Lloyd's quilts in a subsequent post. Art of Color: A New Grasses Exhibit will be on view at the Portland Museum through May 19. A couple of weeks ago I attended a workshop taught by Beth Schnellenberger called "Extreme Embroidery." Beth has been working in this intensive format for several years, filling every speck of base fabric with hand stitching to make elaborate designs. I've admired her work and was happy to have her show us the technique. Happy to report that I have finished the piece that I started in that workshop, hung it at Pyro Gallery last week, and it was sold at the opening reception of our new show. Here's a detail shot. I used french knots for the iris, and plain old straight stitches for everything else. In some areas the straight stitches were neatly aligned in the same direction, but in others they go every which way. I started with six strands of embroidery floss for the blue and white, then switched to three strands for the rest of the picture. Beth had us prepare our white cotton base by fusing it onto a felt background, which gave enough stability to stitch through this heavily without puckering. When I finished, I cut the felt away from the back right at the edge of the stitching, then turned over a quarter-inch of fabric and overcast the edge heavily with black. I mounted it on a 6x6" canvas; you can't see in this photo but the canvas is 1 1/2 inches deep so it has a good heft on the wall. I've felt for a long time that eyes are a good motif for me to work with. I used them a lot in my year of daily hand-stitching, and in my three years of daily collage, so it's kind of a default image when I need to doodle or practice. I think this little embroidery, which I've called "Desert Eye," may be the first in a series. On the jamb of our front door, painted over with several coats of different colors, is a mezuzah, installed (I'm sure) by the first owner of the house, who was Jewish. We're not Jewish, and yet I have a great fondness for that little talisman. A mezuzah is a two-part item. The important part is a little parchment scroll inscribed by hand with the Shema Yisroel, the verses from Deuteronomy beginning "Hear O Israel, the Lord is Our God, the Lord is One." The non-sacred part is the protective case into which the tightly wrapped scroll is placed; the cases come in many different materials and designs. Ours looks like a traditional Torah scroll case, held up by the triumphant Lion of Judah. Jews are commanded to place the sacred words on the doorposts of their houses. That always means the front door, but in some traditions it includes most interior doors as well. In our house there's just the one. There's some difference of interpretation as to whether the mezuzah acts as a protective amulet for those who live in the house, or simply as a sign of an observant Jewish household. (And I suspect that many Christians, if they know about mezuzahs at all, confuse them with the Biblical story of the Jews in Egypt killing a lamb or goat and smearing the blood on their doorposts so God would not kill their firstborn.) I don't exactly believe that ours is shielding us from harm, and it's certainly not signaling a Jewish household. What I take from its presence is the wording on the scroll, "the Lord is One." The world has gotten itself into a lot of trouble over the millenia of civilization when one group of people beats up on another, insisting that their god is the boss and everybody else has to knuckle under. So many lives have been lost in the name of God and I wonder what God thinks of that. If we truly believed that the Lord is One, could we perhaps realize that people of other religions are just as sincere in their beliefs, and entitled to them, as we are? Yes, every religion has its fundamentalists, who tend to be super-sanctimonious and super-eager to beat up on anybody who doesn't go along with all the right footnotes. But I would like to believe that the Lord is One and that most of us on this planet would rather follow His will and live in peace than beat up on others. Happy Passover / Happy Easter. Yesterday Isaac and I dyed Easter eggs, a process that has gotten a lot more complicated since I used to do it with the previous generation. 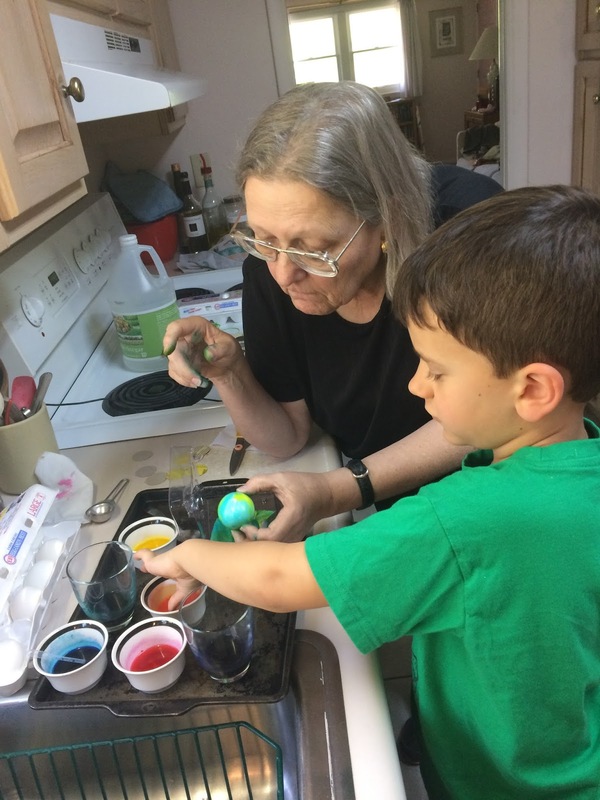 His mom brought over a kit called "Tie-Dyed Easter Eggs," and I was eager to see what that entailed. The kit provided a plastic box with an egg-shaped space in the middle, and two four-inch squares of white cotton. We poked holes in eight places on each side of the space, then wet a square of fabric, wrapped it around the egg, and closed the egg into the plastic box. Then we sucked up some dye into a dropper with a very tiny tip and squeezed it through the holes into the wet wrapping. We put different colors into the different holes, and when the fabric looked totally saturated, unwrapped the egg. It was beautifully dyed, with a few white areas and a lot of pleasant merging of colors. But we decided, after the first egg, that the plastic box was unnecessary. For subsequent eggs we just wrapped the wet fabric around the egg and dropped the dye directly onto the fabric, held in hand. As time went on (we had two dozen eggs) we sometimes dispensed with the fabric, and just dropped the dye onto the egg, or applied it with a finger. A few times Isaac decided to squirt dye onto the egg and rub it around between his palms. That worked too. We just left the last couple of eggs sitting in the dye dishes to make nice dark rings on the bottom end. The eggs were gorgeous. So were the two pieces of fabric. Isaac took one home and I kept one to use in my people project. I also kept the plastic eyedropper; I've never had one with such a tiny tip and I can think of lots of uses for pencil-thin lines of dye or ink. What a long way from the Easter eggs of my childhood, when we just dipped them in the dye and they ended up plain pink. No new technology (except for the useless plastic box) but new imagination, with fabric. What could be better! Conceptual art, which I enjoy both observing and doing, is big on text, and on the manipulation of same. 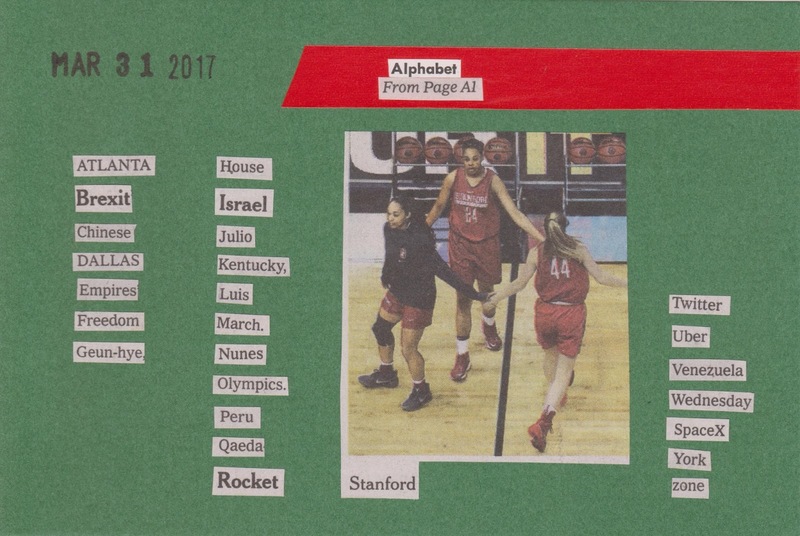 I decided early in my daily text project that it would be interesting to search out certain words in a given area of the newspaper and see what came up. 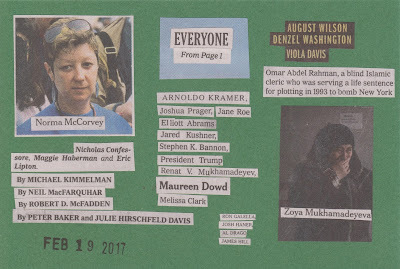 My first approach was to find all the people listed on page one for that day. Next I looked for all the places in that day's obituaries. Then I looked for an alphabet of proper names. What I find fascinating about these lists is that they make you think and wonder. I've done four everybody-on-page-one lists so far. 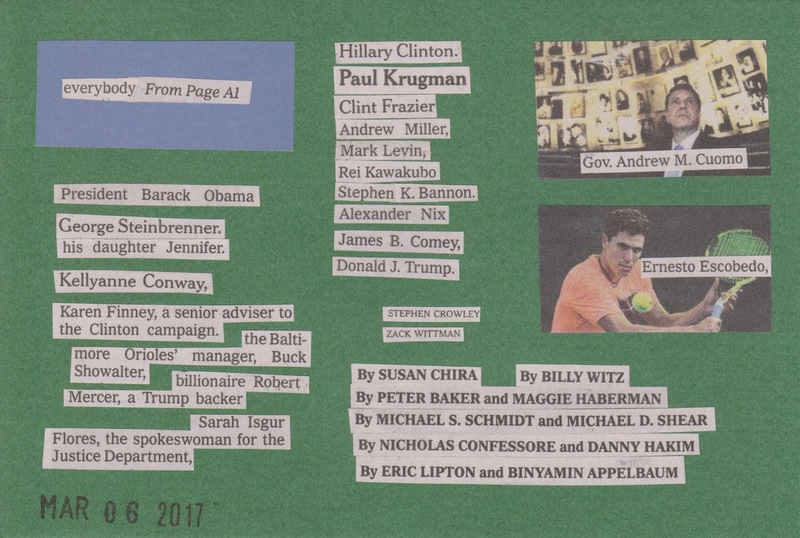 Trump, of course, is on every one, and so is Stephen Bannon. But you might be surprised to find George Washington, not once but twice (and his cuz Denzel once). 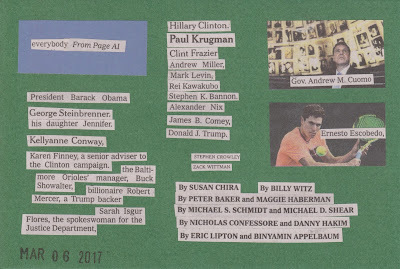 The usual suspects (James Comey, Hillary Clinton, Barack Obama) are there, and so are the Pope, Warren Buffett, Roger Federer, Etan Patz, King Salman of Saudi Arabia and a bunch of ordinary people in foreign lands, many of them crying. 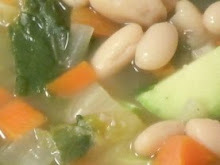 I plan to repeat these recipes many times in the coming year. I look forward to seeing how the front page names reflect what's going on in current events, but also the lives of people we'll never hear of again. Some days, of course, you can't do a decent list piece. More than once I've looked at the front page only to find lots of stories with hardly any people (doesn't seem possible, but it happens), where all the photos are of oil wells or tornado damage rather than of people. 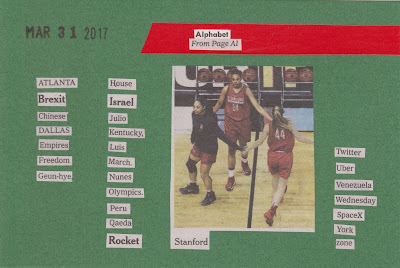 I've done a couple of alphabet pieces solely because I was fortunate to find a Q and an X, although on one I had to use a lowercase z. A good day is finding a guy named Xander and a guy named Zaire, going to Qatar for a soccer tournament. A recurring format in my daily text is to cut haikus (three lines of 5, 7 and 5 syllables) from book pages. Instead of simply finding three separate lines of the appropriate length and pasting them down, this kind of poem is more difficult. It's more difficult to find, because the three lines have to appear in their proper order. 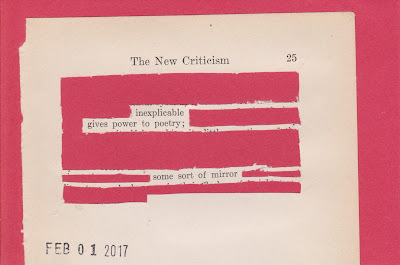 And it's more difficult to paste up, because you have to whip out the X-acto knife and cut all the irrelevant words away, leaving just the surrounding page and the words of the poem. 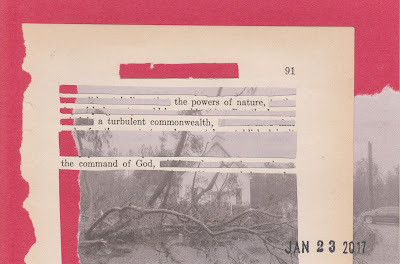 I try to cut long strips of white space between the lines to hold the remaining words in place, but when I use an old book the paper often shreds under the knife or dissolves under the glue stick. So sometimes the poem isn't as robustly attached to its page as I might like. Sometimes I'll find a picture to go with the poem. 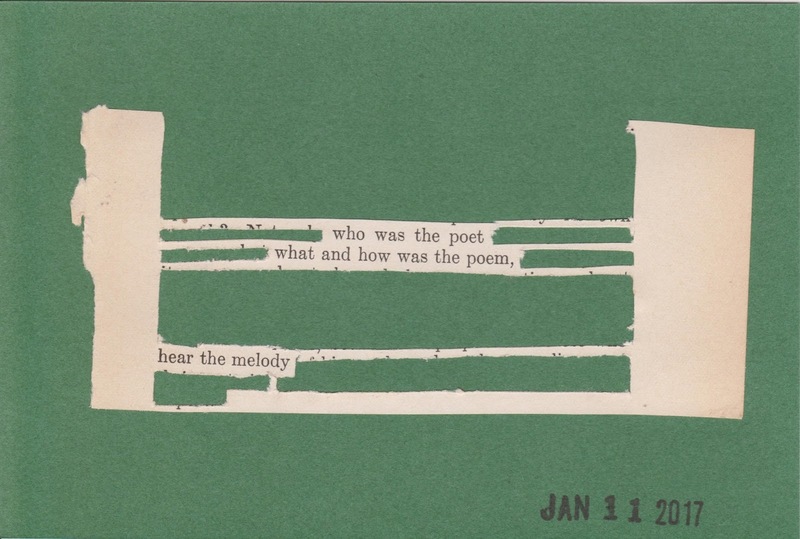 This format of "found poetry" is the oldest trope in my repertoire. I started doing this in 2010 or thereabouts. I did lots of these for gifts and birthday cards. For a year I participated in an online project called "Haiku Art" in which people wrote a haiku each month to a prompt; I would submit a found poem rather than write my own. I spent a lot more time on each one then, but it feels familiar to go back to this method every now and then in my daily art. You can check out all my daily text here. In the next post: found text lists.